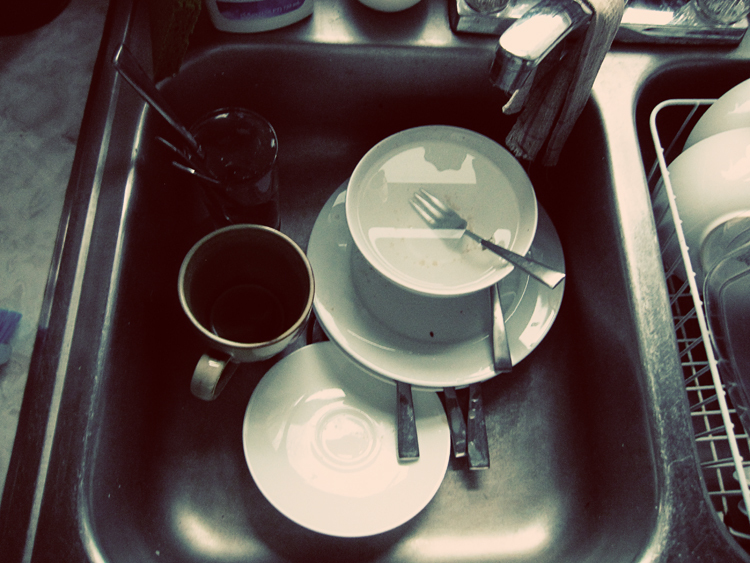 Living in this land without dishwashers, we’ve learned a few things about community. The first one is pretty obvious. And of course I mean this both literally and figuratively. Whatever community you find yourself in, whether it’s intentional community with homeless people sleeping on your couch (probably not) or just your close circle of friends and family–you and your spouse, friends who come over for a movie and popcorn, or the extended relatives for a twice-a-year holiday feast—it’s still messy. Who hasn’t in some way experienced community right inside the four walls of her house, and who hasn’t experienced the physical mess it leaves behind? It’s dishes in the sink, clutter on the coffee table, dirty towels in the bathroom, dirt on the welcome mat. That’s what having people sharing the same space does, even if you’re the kind of person who pays someone else to clean it up for you when it’s all said and done. You’ve seen the mess, so you know what I’m saying. We moved into our house almost four years ago and spent quite a bit of time that first summer doing hands-on fixer-upper projects. We were painting and scraping and mudding, tearing down walls and moving plumbing. We were picking staples out of old flooring, one by one, and we were sanding down the hardwood and laying tile. But amidst all of that life-before-children chaos, we were also planning our future life within those four walls. Enjoy! So we finished the bear of a task of refinishing our floors last week. Now we just wait for 72 hours for the polyurethane to harden. Sanding ended up being more difficult than expected, though not because of the threatening warnings on the upright sander we rented from big-box-home-improvement-store. 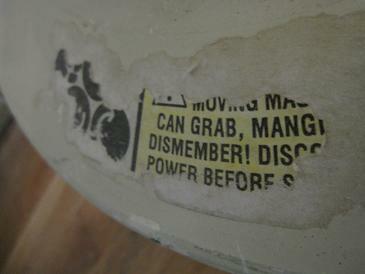 I like that you can read “dismember” but little else. Apparently on really old floors, if the wood is slightly warped, then the new dummy-proof sanders don’t work so well, since they’re made not to sand through your floor if you leave them in one place too long. Basically, we sanded and sanded and sanded, and barely made a difference. J ended up needing to go back through by hand with a belt sander and do every square inch of the living room over. For real. On Saturday morning, I strapped Little Bean into her stroller and set off on a mission: to buy myself a cup of frou-frou coffee-shop coffee. Lucky for me, we’ve got two small coffee shops in my little town, both within walking distance of my house. Unlucky for me, both of them were closed on Saturday morning. A little discouraged, I stood at the corner on Main Street and Hamilton, waiting for the red light to change. A woman stumbled up to the corner, paying no attention to me. She was in sweat pants that looked like pajamas and she seemed tired or worn out or both. When the light changed, Little Bean’s stroller got caught on the curb, so I ended up a few steps behind the woman as we crossed the street. I heard her groan a bit as if in pain and seemingly begin to mutter to herself. I assumed–uncharitably–that she was probably suffering from mental illness or intoxication. Maybe she was homeless. I didn’t know, and I chided myself for jumping to conclusions about a stranger.